« the joys of boys. This week, I have been sick. Kleenex and cough drops and advil have been essential. My mom took care of Atticus even though I was home (I took two naps that day). But let me tell you about the poetry. I spent weeks deciding which poem I would carry on Poem in Your Pocket Day. 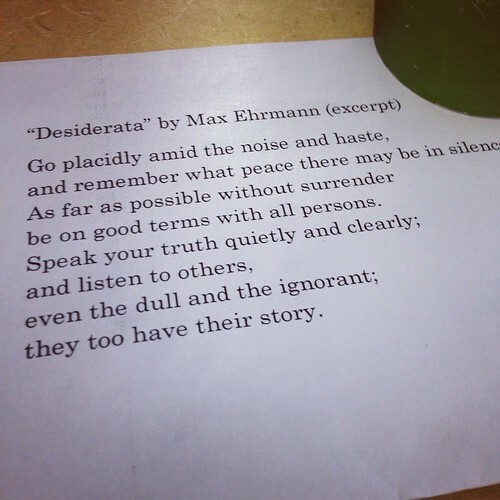 In the end, I settled on the first few lines of “Desiderata” by Max Ehrmann. I picked it because it says placidly. As someone whose every emotion shows on her face, I like the word placid. I strive to be more outwardly calm. Eighty-three people brought poems to the library on Thursday. Eighty-three! I didn’t promote it as heavily this year, so I was hoping for fifty. I always love to see what the students find important enough to bring to me. Maya Angelou: “Into a daybreak that’s wonderfully clear, I rise.” Taylor Swift: “You and I’ll be safe and sound.” Langston Hughes: “Hold fast to dreams.” Justin Bieber: “Girl, you’re my one love, one heart.” Robert Frost: “Somewhere ages and ages since.” William Shakespeare: “Shall I compare thee to a summer’s day?” There were equal amounts of Chris Brown and Rihanna. One song by Kenny Rogers. Several that they wrote themselves. A student brought “Jabberwocky” because he remembered I said it’s one of my favorites. 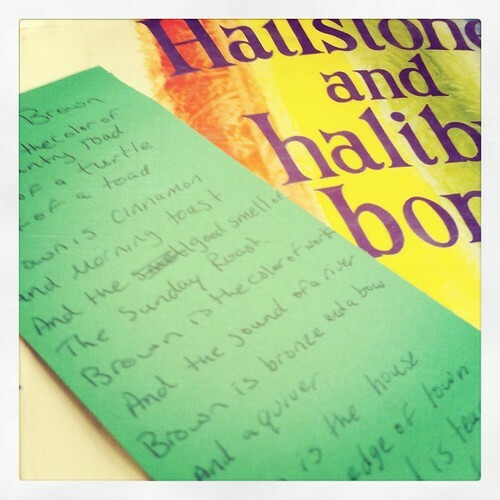 Sharing poetry makes it come alive in ways that reading it to yourself cannot. There were shy smiles and excited eyes, the beauty of language and connection. Sometimes when they handed it to me over the desk, they told me what they like about it. They are neither dull nor ignorant, and they reminded me on Thursday how important it is to listen to their stories. Poem in Your Pocket Day is one of my favorite days of the year, and it is what is saving my life. What is saving your life this week? So…thank you (again). All this reading for midlevel studies this semester has almost fried my brain. I do not see how you stay so well read. I want to read more YA stuff and children’s stuff and MY stuff. How is a teacher supposed to have all this time to read?!?! I’m trying not to get anxiety. Trying to come back to your blog, search for the books I working through, read your reviews and be inspired to keep reading. I read a Russian novel. I may even try my hand at War and Peace! Oh and I taught a 7th grade and 8th grade poetry class two weeks ago. Introduced Robert Frost. I contrasted the Blue Butterfly to the Butterfly Holocaust poem. I like Robert Frost best. Poetry is hard for me sometimes. But I shared with the kids that it seems hard to share it in public (for me) because it is way more vunerable than reading an essay or something you’ve written. It is really like baring your soul. I think they appreciated me saying so.